The tam o shanter is a bonnet, usually made of wool, stretched on a dolly to give it the tam shape. These hats go away back to the before the 16th century and continue to this day. 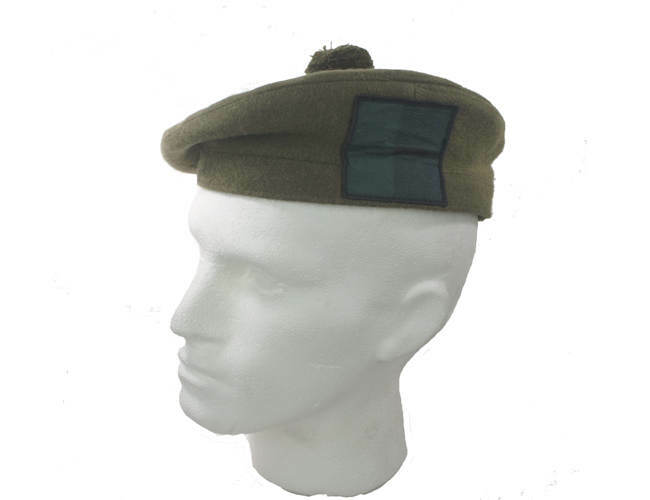 The design and manufacture has changed over the years and this hat has been adopted by the Military.The Royal Regiment of Scotland wear the ToS as undress and working headgear. As the regiments of Scotland combined they can still be identified by the colour hackle they wear on the caps. Red, white, blue, green ,purple and Grey, the last two being TA Regiments. There are some regiments in Canada that wear the hats and the same colour of hackle.The Tam o Shanter is also worn by some regiments of the Australian Army with Scottish roots. This is the tailored version of the issued cap.It is lightweight and cool on the head with the red light lining. Come with bow at back and tassel. The hat comes in various sizes so you can get a good size.